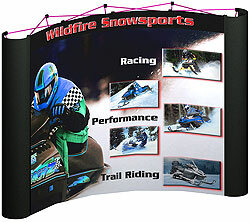 Gamma 10 foot pop up displays are a breakthrough in convenience and flexibility. Their lightweight panels are constructed from strong extruded aluminum frames that “pop” into place, and 21 metal channel bars that attach vertically between the frame hubs and provide support for attaching the display panels. 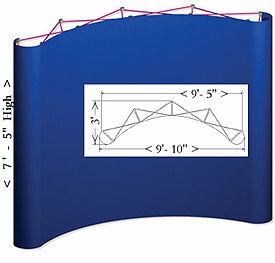 The basic display comes complete with four photographic front panels and 2 fabric end panels. However, the system can be adjusted to meet various design requirements.